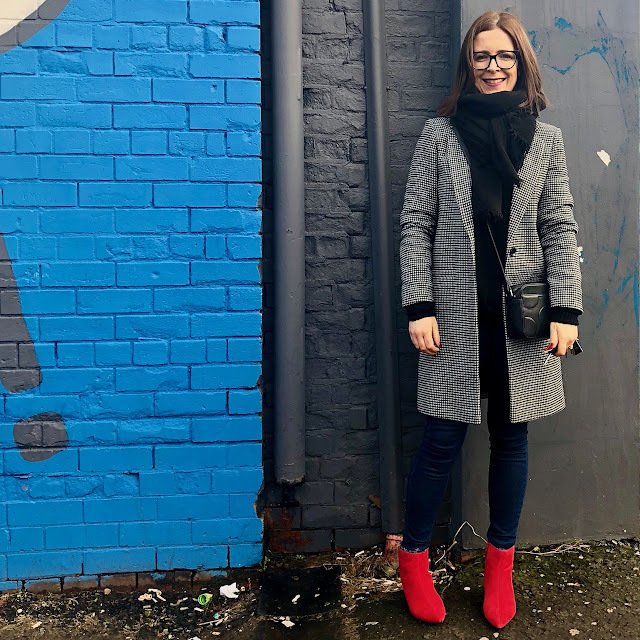 This outfit is one big bargain all made from a ton of little amazing bargains secured in the sales over the past few weeks. Starting with the boots - the red boots that I thought I'd not really wear and have worn in two blog posts in one week. That's £3.45 per wear right there. Yes, I said it on the other blog post - £6.89 in the M&S 90% off red ticket sale. Need I say any more? I got the jeans up in Magherafelt last month in the Daisy & Duke sale. They're the most perfect fit and I like how they're a bit different with frayed hems. 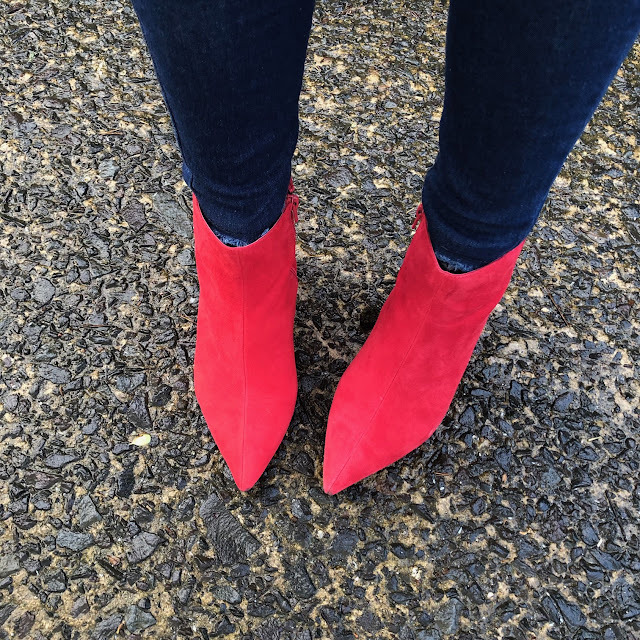 The colour is great too - it's quite a retro denim colour with no fading but they're properly modern with great stretch, making them lovely to wear. The black 100% cashmere jumper is also M&S and I got it relatively early on in the sale so it was about £35 I think. I had a message last week to say that these jumpers went down to £11 in the end. But I'm not crying as I've worn it lots in recent weeks. Key to this sale bargain is that it's a size 22 - don't rule out gorgeous soft and warm cashmere just because it's not in your size. What is meant to be a neat fitting knit for a curvier lady could be the perfect slouchy knit on someone a few sizes smaller. You can see the current range version on this link - only larger sizes left as is always the case with black cashmere. Keep an eye out for 20% off deals with M&S - best time to snap cashmere up. Also worth keeping an eye on the Woolovers site as they do great sale cashmere at times during the year. And don't rule out men's cashmere jumpers - often the smaller sizes end up in the sale! My next sale bargain are my 100% cashmere wrist warmers (similar here) which I got in the 90% off in M&S on Thursday for £4.25. Now I've seen other blogger wearing these and was a bit sceptical. To me they seemed like something firmly in the unnecessary accessory department (along with furry ear muffs). And perhaps they are a bit frivolous for £45 but as someone who has Raynards in her fingers and constantly cold hands....yet hates wearing gloves, they're actually pretty cool! They have thumb hooks and can be pulled down further on your hands but I had been at a coffee shop so I've got them shoved up a bit. But even at that - they're like socks for your wrists. Cosy central. Finally finally...the coat and this one is a preloved bargain from a lovely girl I follow on Instagram called @Joprado. She mentioned last week that she was selling off some of her clothes and I immediately nabbed this F&F checked coat which was brand new to her. It's still showing online in size 18 and has been reduced to £27 so worth perhaps checking in-store if you need a different size. There's a lovely one also on the Pretty Little Thing site on this link. 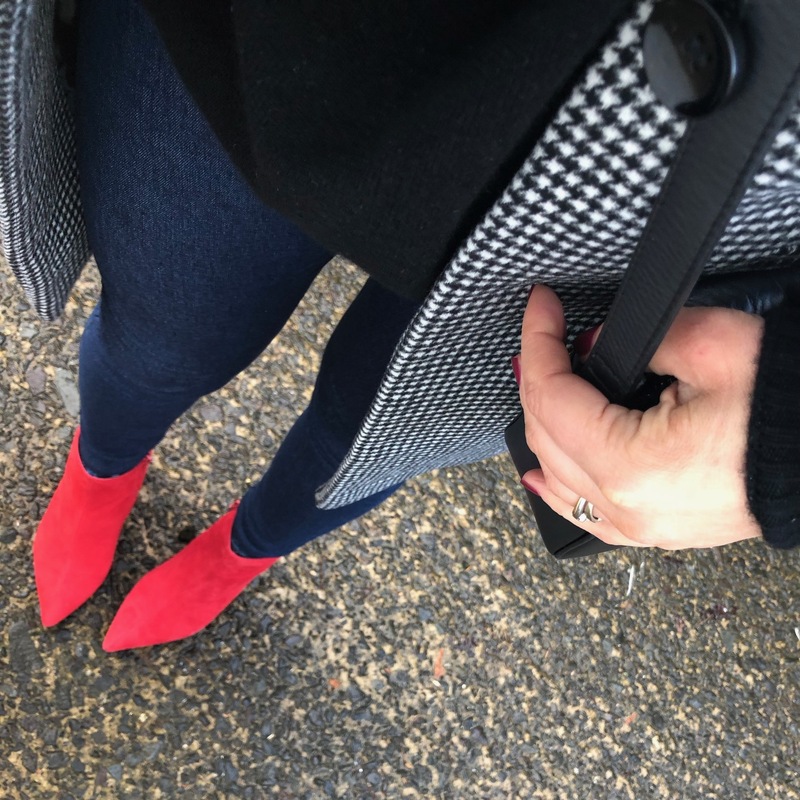 I love my Stradivarius checked coat (on this link) but I've had to accept defeat on it as it's too big and every time I put it on, I feel swamped. I've looked into getting it altered but it's going to cost too much with no guarantee that it would work so I figured it was time to cut my losses & sell it. This F&F one is going to fill that gap really nicely. I like that it doesn't have another colour in the check as I think it makes it more versatile. Total cost of outfit? Less than £70 (and half of that is the jumper). I've not included the bag as it was a gift...but it was in the sale until it sold out a few weeks ago. Some serious love for this bag...it's been used so much! When do M&S do 90% off sales?? I never hear of these!